This is a single player, keyboard controlled 3D platform game. 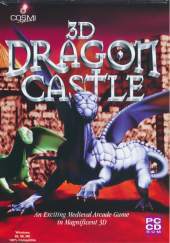 The player files a dragon and the object of the game is to squash all the other dragons in each level and collect coins and keys all of which score points. Being squashed by another dragon, Prehistoric Monsters, falling into a lava pit or being caught up in a torture device all cost a life. The player has three lives with which to score as highly as possible and the full, registered game, has thirty levels.